When I came up with the idea for One Week With/out four months ago, it was mostly a personal endeavor–a dare, really. I knew that something was out of balance in my life, but I didn’t know what it was, or whether I was doing it too much, or not enough. All I knew was that I needed to do something differently, because I wasn’t satisfied with my lifestyle, or my life for that matter. In the months that have followed I’ve tried everything from waking up early, to being 100% honest, to living as a vegetarian, temporarily at least, in hopes of finding what it was that was out of whack and fixing the problem. And you know what? I haven’t found it. What I found instead was even greater than what I was after in the first place. Sure, taking One Week With/out challenges can teach you a lot what life is like without your bad habits, or reveal the lasting value of good habits you try to pick up. But the true power, and the lasting effects of these challenges lie in what they teach you about yourself. When I started this adventure, I felt trapped in my habits, my lifestyle, and my routine, to the point of futility. I was afraid. What would I do if I lost my job? What would be left of me, if I couldn’t sustain my lifestyle? Certainly, this must sound ridiculous, but I simply felt like I didn’t know myself outside of the habits and routines I had accrued over the years. The One Week With/out process gave me power over myself. By constantly questioning what is normal in terms of behavior, habits, and consumption, and cutting the cord–if only for one week–I began to distance myself from the standard operating procedure of my life and find the true self that I had buried underneath all of that baggage for so long. The consequences of this discovery have not been simple, or convenient, but I wouldn’t trade them for the world. Over the past few months, I’ve switched careers, lost 20 lbs., started saving to travel the world in 2015, and entered a whole new realm of uncertainty about the direction of my life. But I feel free, full of possibility, and genuinely excited about the future. These One Week With/out challenges have changed my life, and I’m nowhere close to finished. But there’s been something nagging at me for some time now: One Week With/out is way bigger than me. A number of people have written me, tweeted at me, or tagged me on Facebook telling me about their own One Week With/out challenges, and it’s time that this site becomes a home for the adventures and experiments of the whole community, myself included. Are you ready to take the challenge? You can repeat challenges I’ve done, or try quitting a bad habit, or picking up a good habit, of your own. Whatever makes the most sense for where you’re at. For more direction on how to start your own One Week With/out challenge, start here. Sharing your experience is one of the best ways to solidify what you’ve learned and put it into action moving forward. If you’re comfortable, when you’ve completed the challenge, write up a bit about what you’ve learned from it and send it to scott@oneweekwithout.com (it might be a good idea to write me before you write it all up so I can give a bit of guidance). You don’t have to have great writing skills, and it can be as short or as long as you feel it should be. The important part is challenging yourself, testing your limits, and sharing your experiences. Questions? Concerns? Overwhelmed by metaphysical angst? Email me at scott@oneweekwithout.com any time, I’m happy to help any way I can. Scott–your challenges are inspirational! A big suggestion is to create small punishments for every time you slip during the week. Like when you slept in late or when you “accidentally” logged onto social media. We NEED to hold ourselves accountable. WE PUNISH OURSELVES, TO PUNISH OUR OPPONENTS! 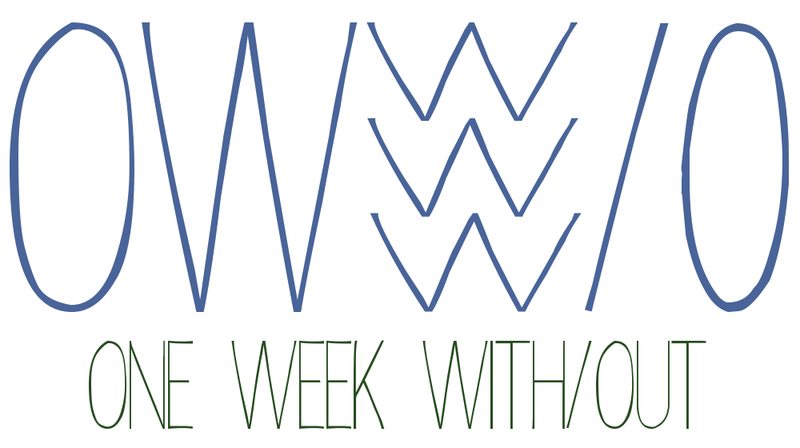 This is an awesome opportunity for other people to share their ‘one week without’ experiences! I have a couple questions so I’ll send you an email, I would love to participate in this! Thanks Monique! I’m really excited to see what comes in. Feel free to ask any questions at all, I would love to have you contribute! I have been doing the same thing myself a lot over the past few months. My “problem” is that there are so many things I’d like to change, and I tend to get a bit impatient. As you know, it’s usually rather inefficient and challenging to remove/add more than 1-3 habits at a time. I like to write daily lessons each day. Then review them at the end of each month. That gives me great feedback on what to add/remove.